I don’t think I’ve ever visited a place with so many castles, palaces and beautiful gardens in a single place. With so much beauty surrounding this little UNESCO World Heritage Site, Sintra really is a trip you absolutely have to make when in Lisbon, Portugal. Palacio de Pena is the monument that gets most of the limelight, and understandably so. I’ve been there and it is genuinely beautiful with its bold colours, interesting architecture and vast views at the top. But if you visit just one other place in Sintra, do yourself a favour and make it Monserrate’s Palace & Gardens. You’ll thank me later. Getting to Monserrate is super easy; there’s a bus service (No. 435) that runs every 20 minutes and takes you from Sintra’s town centre right to the entrance of the Monserrate gardens for just €1. You can also take an Uber which cost me just under €6 for the 5km trip, so still not bad at all if you’d prefer a faster and more private way to get up there. Once we reached the gates of Monserrate and paid for our entry, we decided to take a stroll through the gardens instead of rushing directly to the palace. Trust me, it’s worth it — especially if you enjoy taking photos. You’ll come across a range of beautiful scenery including waterfalls, greenery and flowers which make for awesome photo opportunities. There are even dedicated gardens influenced by different countries around the world, including Mexico, Japan and South Africa. All in all it’s a really nice walk, especially on a sunny day. When we finished making our way through all the gardens we got to see the palace up close, and let me just say that the photos do it no justice. 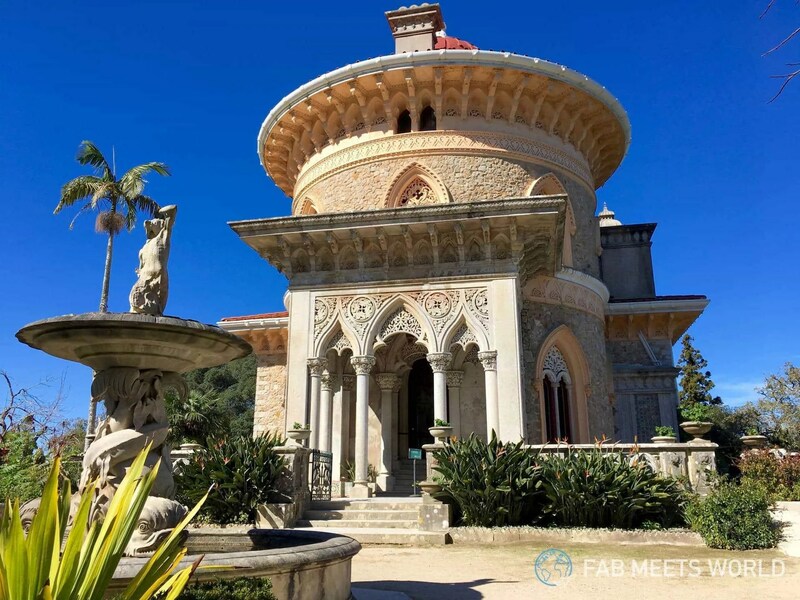 Just as with Palacio de Pena, Monserrate’s design flair leaves you in awe and it’s fair to say that we spent a good 20 minutes just standing outside taking photos of it. It really is a stunning building. Monserrate Palace combines a gothic and Moorish influence but what stands out the most — at least for me — is the Indian influence here. Everything from the architecture to the gardens surrounding this palace feel exotic and luxurious, and it certainly has more of an eastern feel as opposed to a European one. For a brief moment, I actually felt like I wasn’t in Portugal. After a quick stroll inside, you come to realise that despite its lavish looks Monserrate “palace” feels far smaller than what you’d expect from a conventional palace. Its size certainly doesn’t take anything away — the palace is still gorgeous — but I was just expecting it to be larger. On the ground floor you’ll find a library which is still preserved in its natural state, but little else to be honest. Head downstairs and you’ll find a vast kitchen, and if you take the stairs near the main entrance, you’ll reach the 1st floor with a few rooms. There’s nothing particularly interesting in any of them, but there’s plenty to admire in the surrounding decor and architecture on the walls and ceilings. Even though the rooms within Monserrate Palace have been left quite bare, the architecture, detailed design, colours and luxurious feel of this place make it feel well worth the visit. Add to that the beautiful gardens that surround the palace, and it’s the kind of trip that’s totally worthwhile if you’re in Sintra, especially if you’re after some great photos.